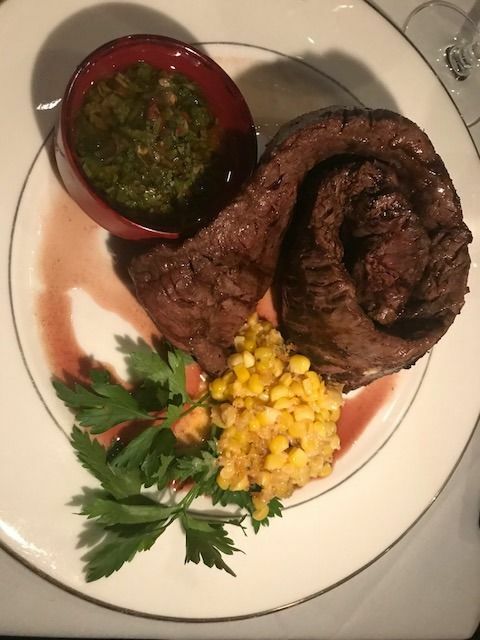 Can this skirt steak weigh just 12 ozs? It stretches and curls across the plate. Photo by Dana Stoddard. My niece Dana lives mostly in Manhattan now with only occasional recharging visits to Big Fork, Montana, where she and her husband Craig camp out in Glacier National Park and cool off in the lake. But with both of us in town this Fourth of July, she wants to see fireworks. 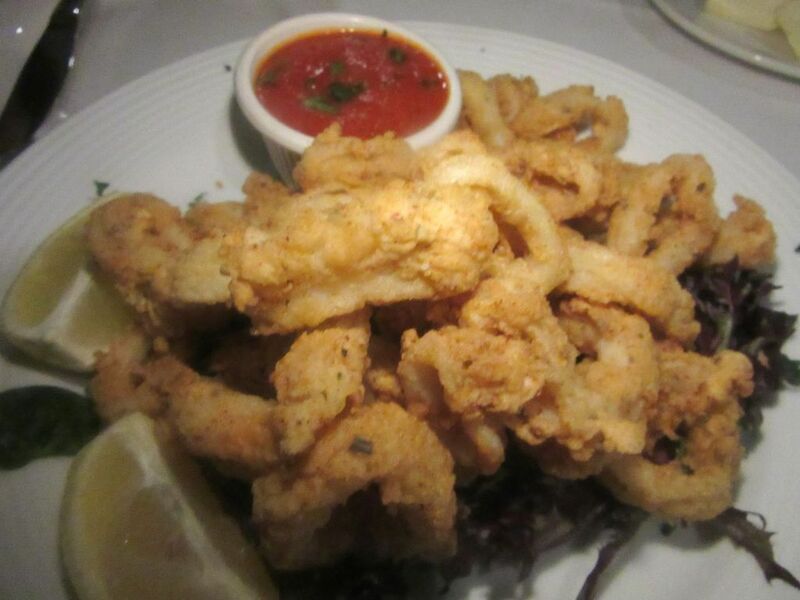 Deep-fried calamari seems to be an addiction at dinner recently. 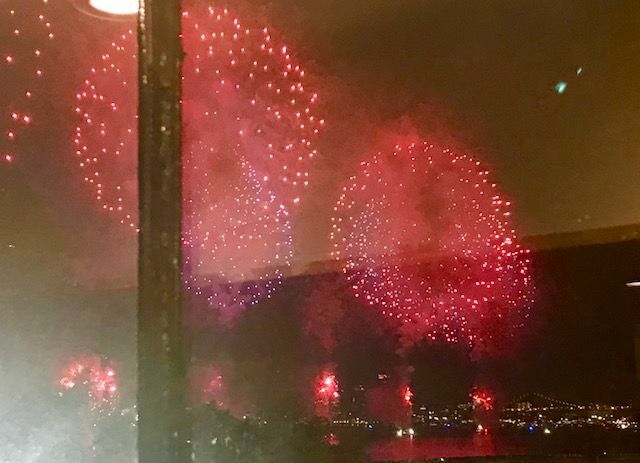 I used to stake out a chaise on a friend’s terrace when the explosions sailed into the sky over the Hudson. For a while I was willing to hear the bang and not see much in order to join Barry Wine (star chef founder of Quilted Girafe) on his terrace sharing in a whole grilled pig. I was too caught up chewing cheeks and ears and monopolizing salads to take photos. 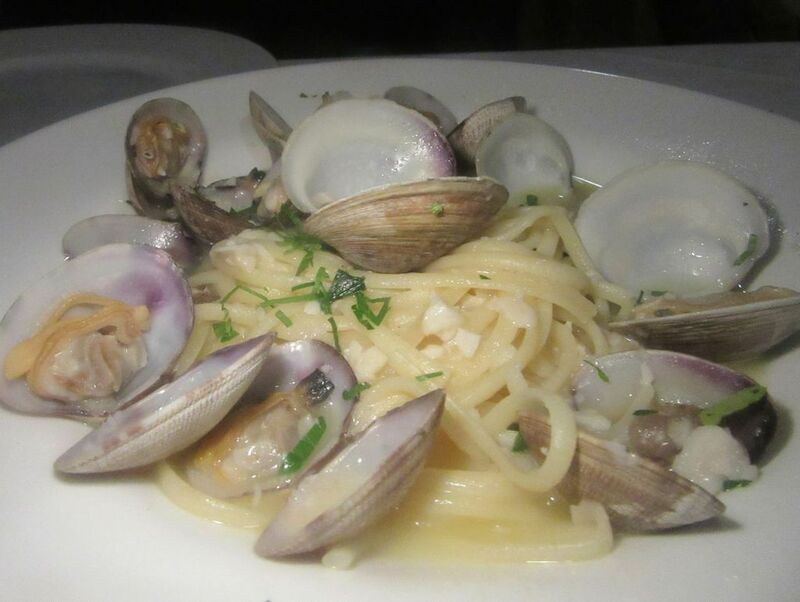 My niece and I share linguine with clams in the shell during our first meal at Tudor City Steakhouse. But Macy’s barges were lining up in the East River this year. I call East Side friends to see if anyone has a view from a roof or terrace. In recent years, as the city’s population soars, police surveillance has multiplied and sightseeing crowds get locked into pens. That can’t be very pleasant. There’s definitely a Tudor feel on the patio entrance to Tudor City Steakhouse. Happily, my pal Shelly Clark thinks her client, Tudor City Steakhouse, will have an excellent view. The house is not charging extra and they’re willing to save me a table with a river view in that historic district. I invite Shelly to join Dana, Craig and me for dinner. Perhaps you remember this address on Tudor Place as L’Impero or Convivio, the stages for starred Italian kitchens from Michael White and Scott Conant. It had stood empty since 2011. 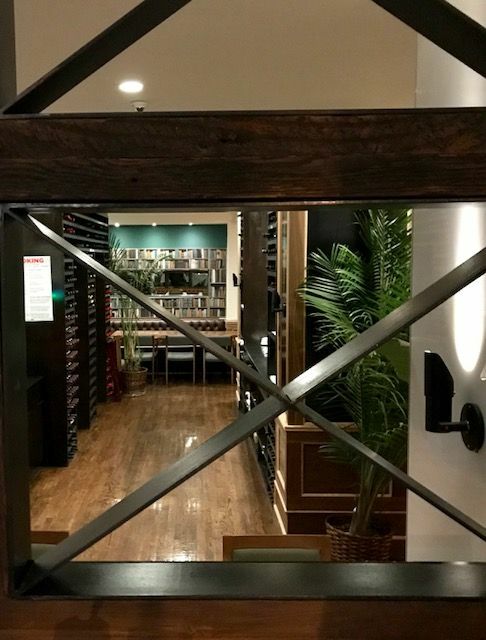 There’s a view of palms and on into other rooms from our table for two up a few steps. Entering Tudor City, with its gardens and private parks, has always seemed to me like escaping to an English village. Before it was built with its back to First Avenue, this was an area of tenements, known as “Goat Hill” and later, “Prospect Hill.” It feels far across town and still like a fantasy, away from Manhattan cross streets. 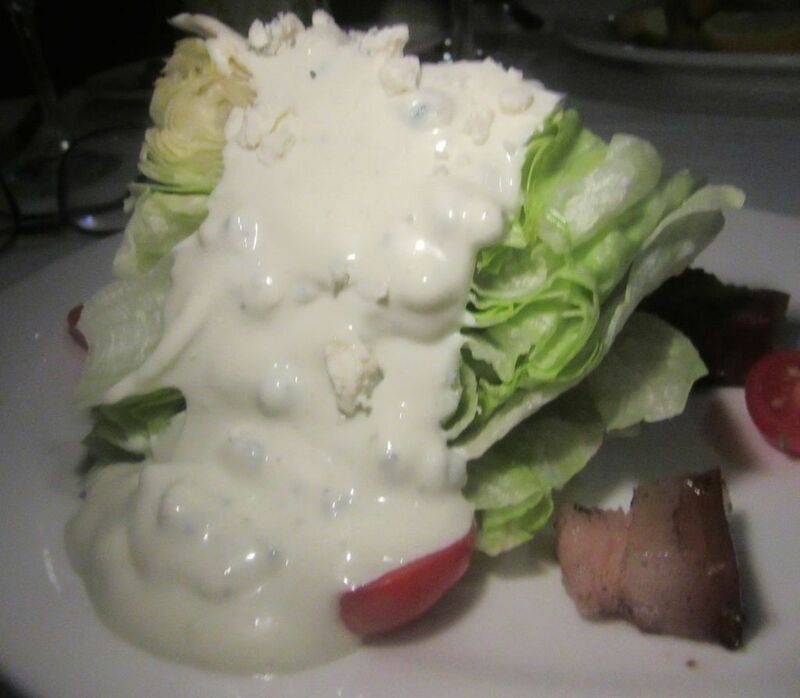 I can almost say I never encountered an iceberg wedge that I didn’t like or that didn’t remind me of my mother. This is the steak we shared at our first dinner. 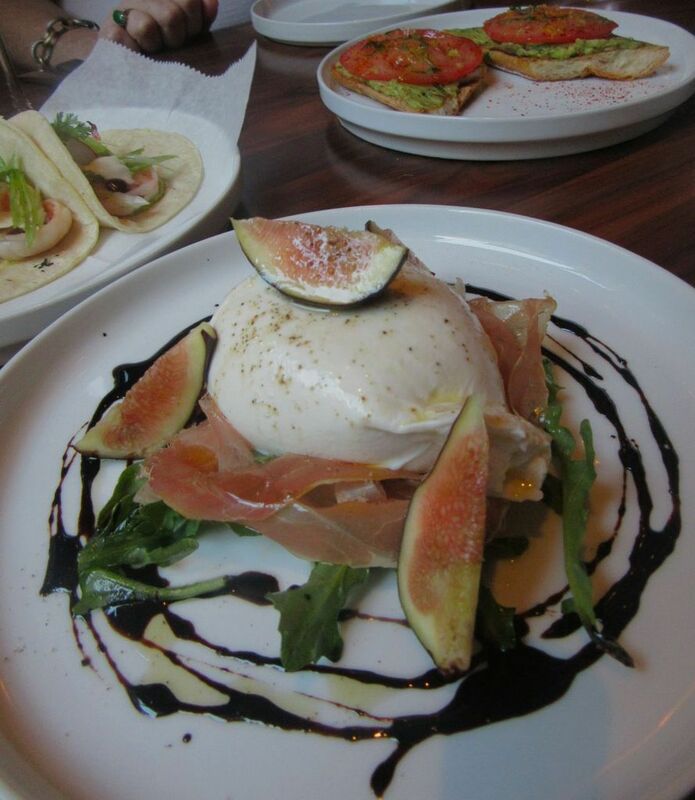 After a wedge and linguine, we could only eat a slice or two. 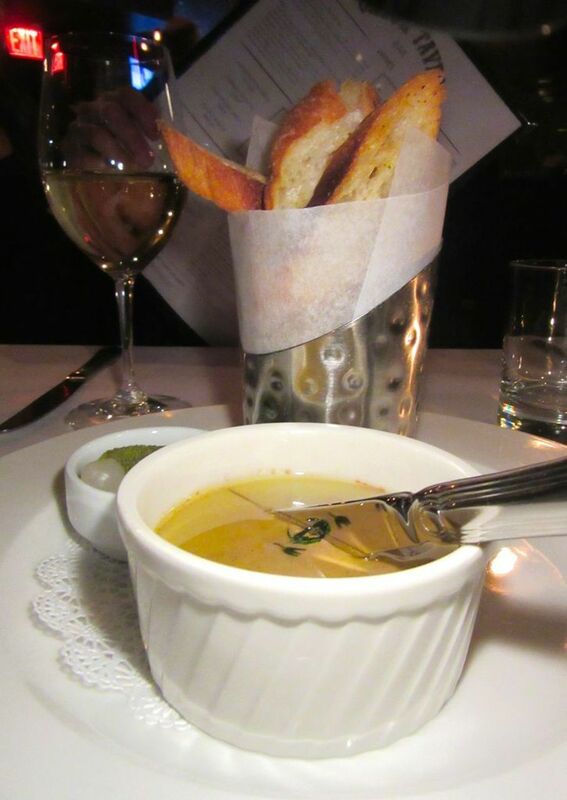 Actually, back when the steakhouse launched in January, Dana and I shared linguine with clams in the shell, a perfectly decent steak, an iceberg wedge with lardons, and a canning jar of banana cream pudding. That is, she watches me barrel down with a spoon to get all the sweet layers. Dana isn’t much moved by sweets. Sometimes I imagine she gets thinner watching me dip in. 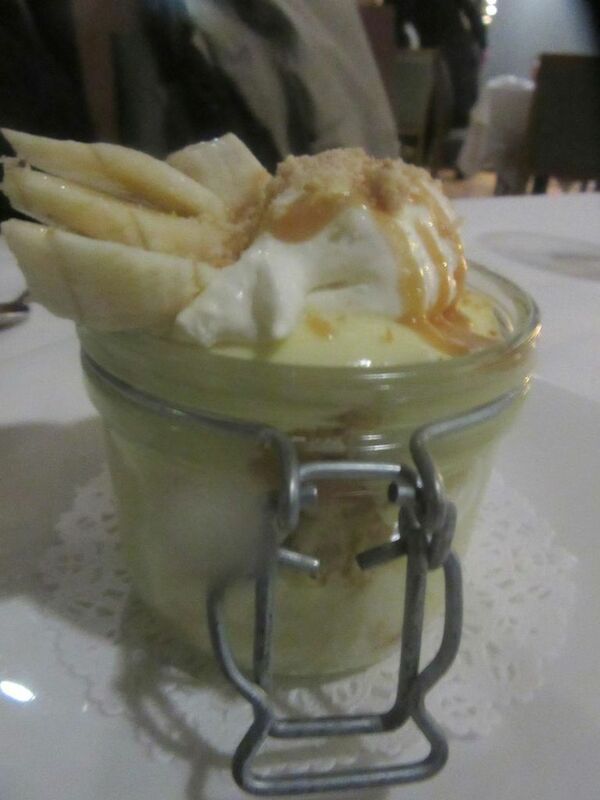 It’s a reviewing dinner, so I feel obligated to order this banana dessert. The service was friendly. The kitchen dawdled. With its various levels, wood paneling and scattered palms, it struck me as just another Manhattan neighborhood steak house with a few eccentricities: Venezuelan tamale, shrimp ceviche with avocado and popcorn, and a mixed Peruvian seafood salad with Huancaina sauce. 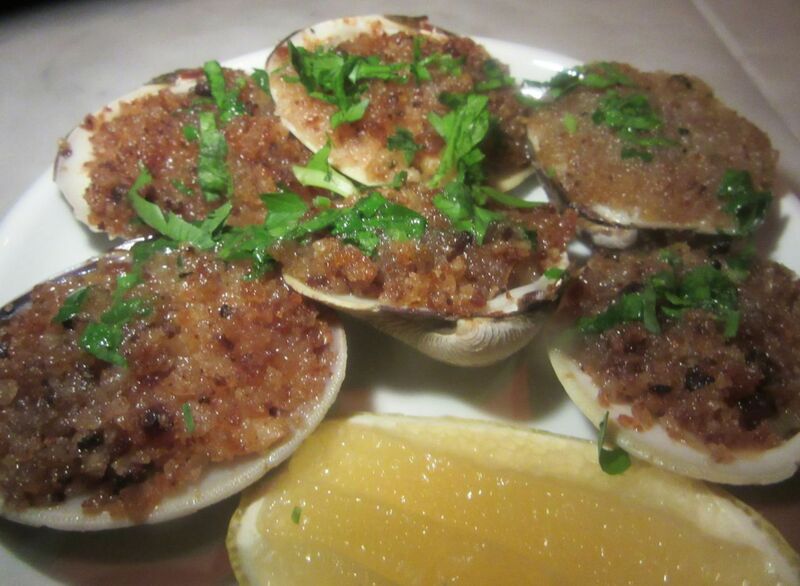 Months after that first dinner, Tudor City Steakhouse still feels mostly unexplored. Not many zealous carnivores or fireworks fans are seeking it out even tonight, I’m surprised to discover. Indeed, the only entrance to Tudor Place on East 41st Street is blocked off by barricades on Second Avenue and a New York City policewoman. She asks us to prove we’re residents or show a printout of our dinner reservation. I have neither. I start to argue. She takes my arm and escorts me to where my taxi would have turned in at the end of the block. “This is a long walk,” I complain. “You should drive us there.” On this steamy night, it does seems far without a cab, till finally I stagger across a bridge above 42nd Street with its river view. And then, the entrance. If a salad isn’t a wedge, it will most likely be a Caesar. I know, it’s not a diet dish but at least it’s near-green. There’s an unopened Robert Mondavi bottle on the table. I assume it’s meant as a gift. The sommelier decants it. Dana orders a glass of rosé. Craig studies the list of vintage scotch and chooses a $26 glass of 25-year-old single malt Old Pulteney. 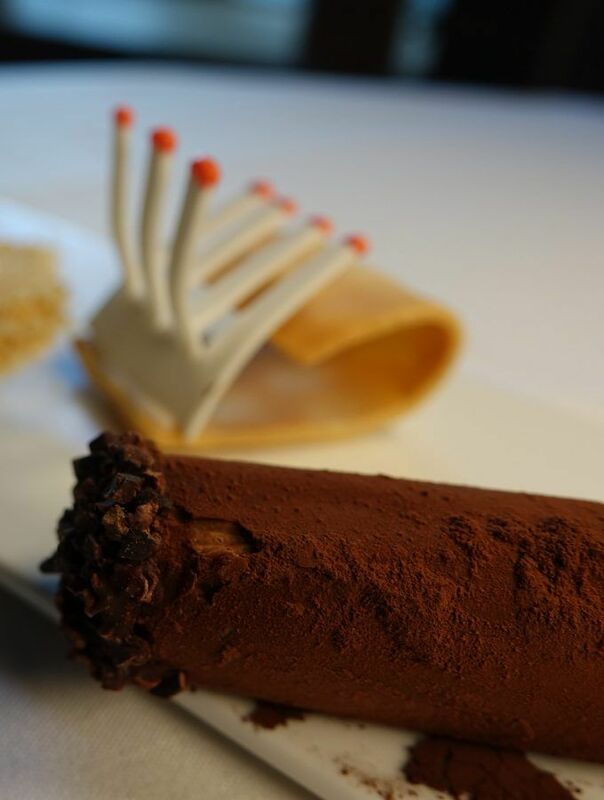 It claims to taste of dark chocolate and heavy spice, lime honey, baked apples and orange peel. Craig sips and grimaces from the shock of how strong it is. “Wonderful,” he assures me. 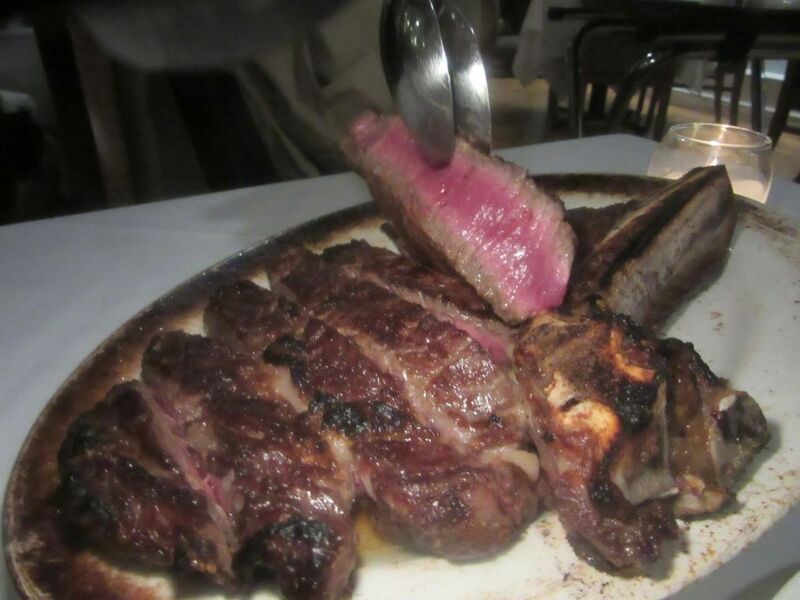 A waiter passes by to show off the heft of the thick house tomahawk steak we four could share. We’re hungry, eating olives and waiting for starters. I send back the bread, hoping it will be better toasted. It returns warmed, not toasted, and not that much better. 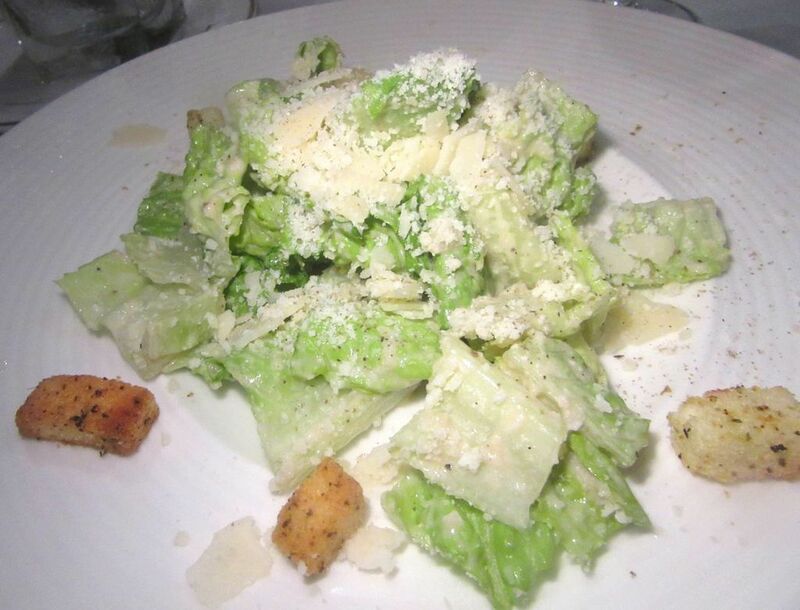 A small Caesar salad has been miraculously divided into four good-sized portions. Dana isn’t that hungry and husband Craig wants the red snapper special of the evening. Dana’s sautéed asparagus seems too modest to split. But she passes along chunks of her thickly battered calamari. 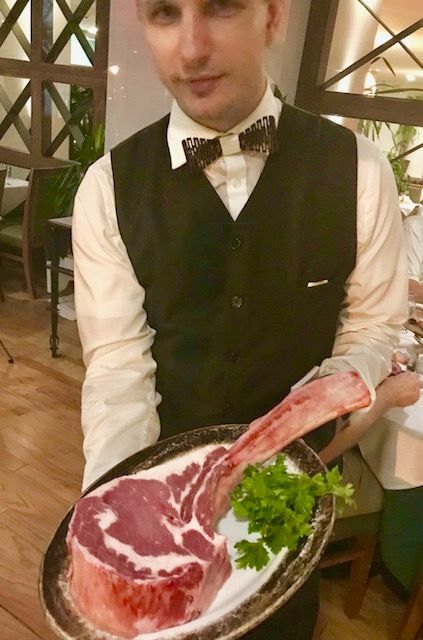 “Shall we order a tomahawk steak?” I ask, as the waiter passes by with an extra thick specimen. 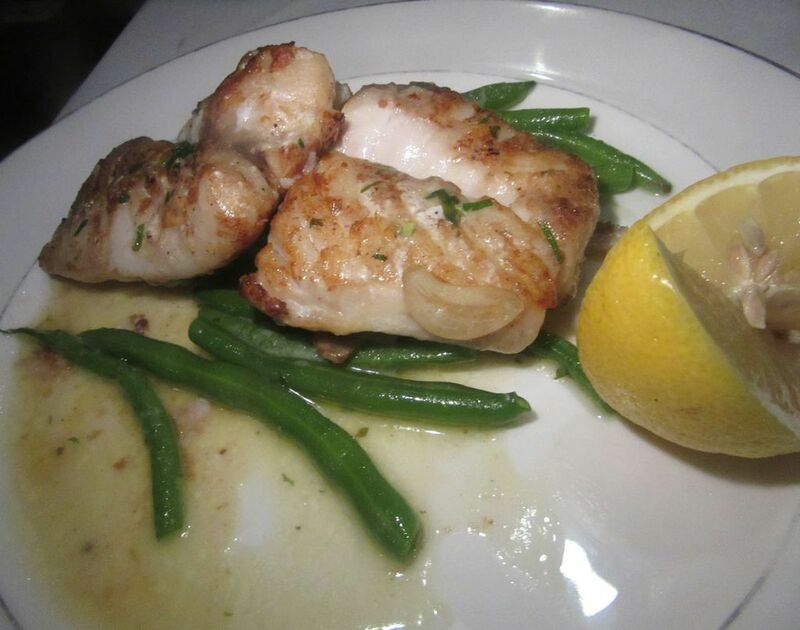 There are so many options -- chicken Milanese, lobster risotto and vegetable lasagna, Frenched rib lamb chop and “serious NY veal chop.” Even a chili burger with roasted peppers. Shelly got us the best table in the house for the fireworks and if she wants Chilean sea bass, so be it. But Craig and Shelly want fish. He orders red snapper. 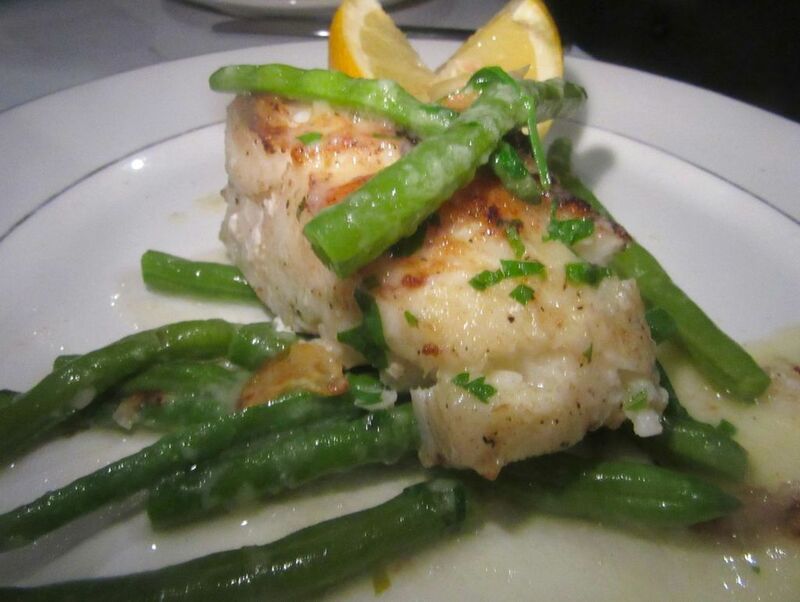 She asks for Chilean sea bass. I’m the only meat eater. I could have a rib eye or a strip of sirloin and surely someone would help me finish. For some reason I’m feeling full -- all that bread maybe. I order a skirt steak, rare of course. The menu promises 12 oz., but it curls and wraps and stretches across the plate, chewy and tough, but delicious, more than I can handle. 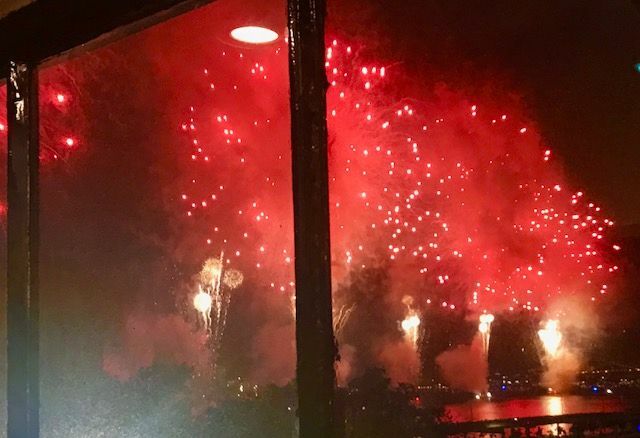 We have great seats to watch Macy’s barges shooting off synchronized fireworks from the East River below. A side of rich truffled creamed corn, ordered for the table, distracts me as the fireworks begin. Dana stands at the window. A young man from the next table leans in. Craig goes out to join a crowd watching from the bridge. The sky explodes pink and red. Afterward, I suggest we order Bruni Bueno’s cheesecake with blueberry-scented cardamom, mint and cookie crumbs, but no one is hungry. 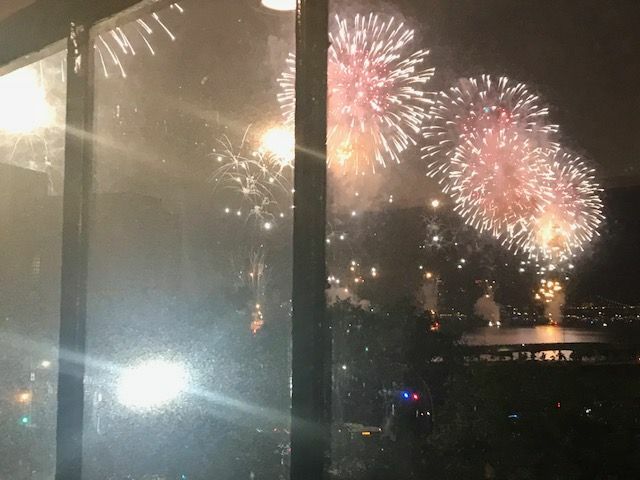 I was never one of the fancy folks who got invited to see George Plimpton’s Hamptons show of Grucci fireworks years ago in Sagaponack. But somehow I found myself there one evening in the crowd on the beach. I remember sitting on a blanket with my friend Michael when he insisted on leaning over to introduce himself to Jacqueline Kennedy on the neighboring quilt. I wanted to tell him to stop bothering her, but then it struck me…she was alone, and she was pleased to be bothered. Maybe she didn’t mind at all that he happened to be a very cute guy. The fireworks started. Sparks and embers fell. George ducked. We screamed. Did you shield her, Michael? We were spared, just far enough away. 45 Tudor Place (enter on 41st street, exit on 43rd street). 212 682 4000. Monday 11 am to 10 pm, Tuesday through Friday 11 am to 11 pm, Saturday and Sunday 5 pm to 11 pm.